Here's GLADiator Braum for Bulletkid! I love it! 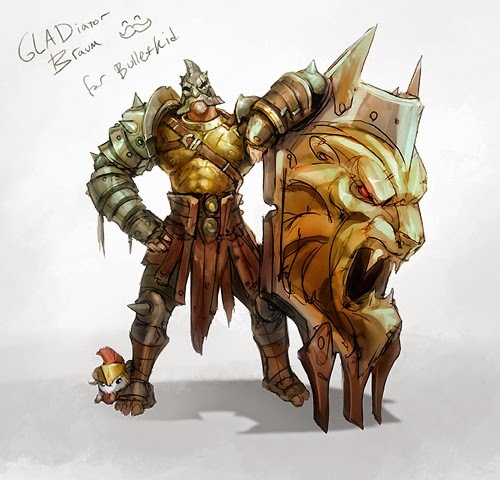 I have been working on a Gladiator Sion lately and I saw this, and it gave me some ideas for the arms. Braum and Sion are really very similar in armor, they are kind of counterparts, with the Axe vs. Shield, moustache vs. beard (ish,) killer vs. protector. I love this concept, and the lion really goes well. You're probably my favorite digital artist at the moment, keep it up! By the way, if you get to it, a Commando Karthus or Tennis Player Ekko would be cool, check out my post on the boards. Ahh, the poro! So cute. The door's pretty awesome, but the poro just makes it so much better.